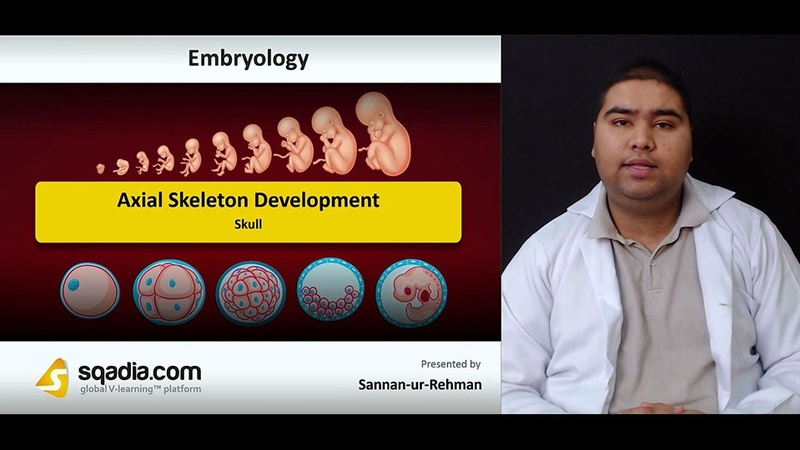 The following lecture presents detailed information on the topic Axial Skeleton Development. Section one of this lecture focuses on Components and Origin. The educator presents an Introduction of this topic and then moves towards the discussion of Embryological Origin. The process of Ossification/Osteogenesis is highlighted and under this topic, the educator explains Intramembranous Ossification plus Endochondral Ossification. In section two, the concept of Skull is explained. After an overview of different parts of Skull, the educator elaborates on Membranous Neurocranium. Later, light is shed on New born Skull after which an elucidation of Chondrocranium and Viscerocranium follows. Section three is about the Clinical Correlates of Skull. The educator begins this section by speaking about Cranioschisis and Craniosynostosis. Subsequently, defects such as Dwarfism, Acromegaly and Microcephaly are highlighted. Section four is regarding the Vertebral Column. In the start, the educator presents a detailed overview of Vertebrae and Intervertebral Disc. Subsequently, Vertebral Column is comprehensively demonstrated followed by an extensive discussion on all of its Clinical Correlates. The prime focus of section five is the Ribs and Sternum. The educator sheds light on Ribs and Sternum separately in the start to clarify their concept. After this, the Rib Defects are reported. At the end of this section, a thorough explanation of various Sternal Defects is addressed by the educator.